A resident since 2009, Andrew Homzy pursued a dream to create a jazz festival in a town which can boast about a high level of accomplishments and contributions to music. A short list of the jazz talent born, living or working in Nanaimo includes Christine and Ingrid Jensen, Marty Steele, Greg Bush, Pat Coleman, James McRae, Steve Jones, Ken Lister and Diana Krall – and well includes jazz educators such as Bryan Stovell, Rick Becker, Carmella Luvisotto and Michael Irving. 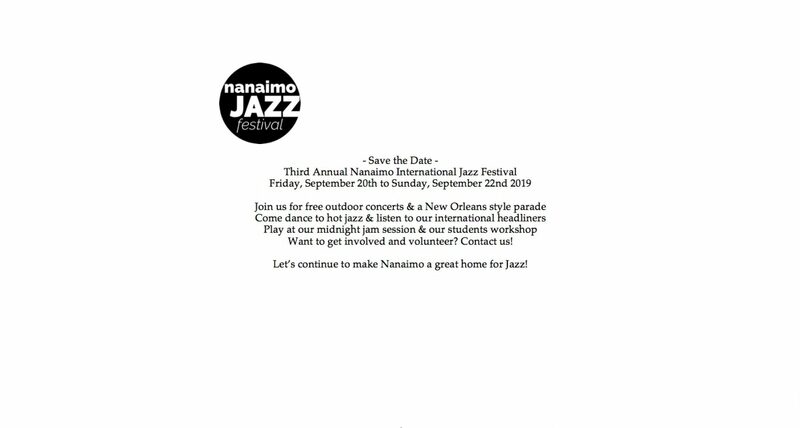 The long list of Nanaimo region jazz people would fill this page. Trying to reconnect–it’s been a minute since we were at the Smithsonian’s Ellington Collection in 1989! Hope all is well, looking forward!